The Central Bank of the Republic of Turkey issued Turkish Old Lira banknotes in 15 different denominations, including this 1000 Turkish Old Lira banknote (7th emission group 1970). They are part of the obsolete Old Turkish Lira banknotes series. The Central Bank of the Republic of Turkey started issuing these 1000 Turkish Old Lira banknotes in 1986. They were withdrawn from circulation in 1998. 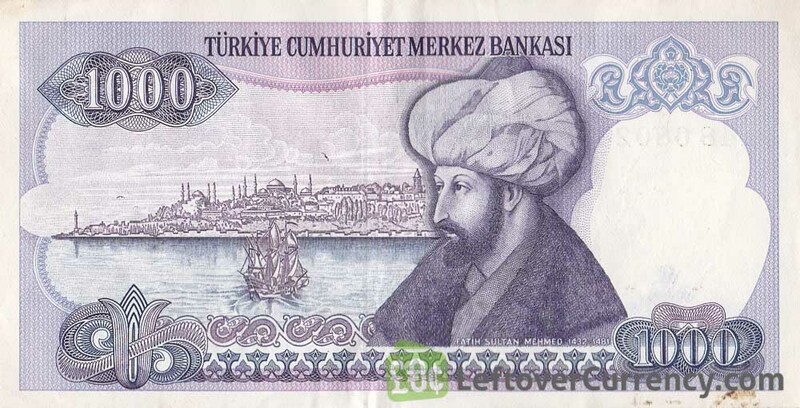 The bill of 1000 Turkish Lira (Bin Türk Lirasi) has an image of the coastline of Istanbul on the back side. The bearded figure with the turban is Fathi Sultan Mehmet. On the front side of the one thousand Turkish lira note is a portrait of the founding father of modern Turkey, Kemel Atatürk. Repeat these steps for any other notes and coins you want to exchange. Complete checkout and get paid within 5 days of receiving your currencies. 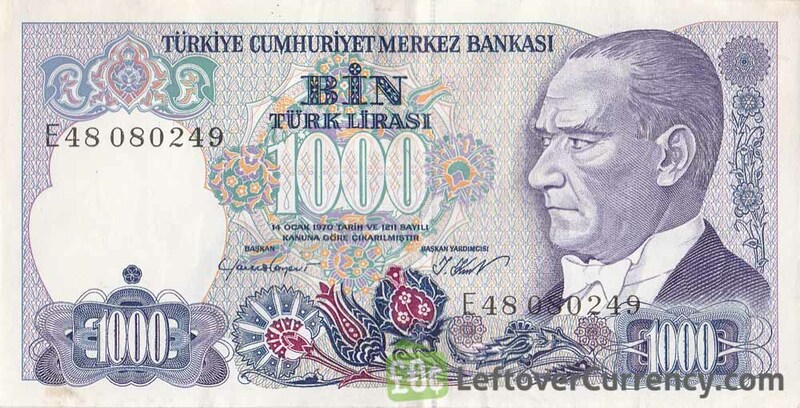 To exchange your 1000 Turkish Old Lira banknote (7th emission group 1970) for cash: add it to your wallet now!